Anveo Call Recorder is enterprise level call recording solution with multiple storage options including Anveo.com, Amazon S3 and FTP as well as HTTP integration. We were asked by customers to add a call recording option to automatically record incoming and/or outgoing calls. After careful analysis we implemented a flexible call recording solution designed to meet diverse needs of our users. 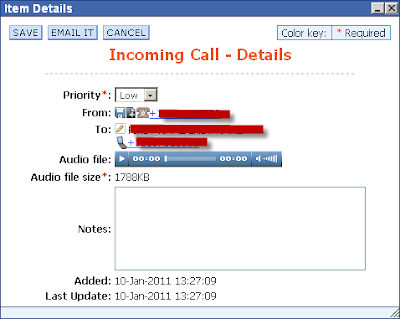 customizable recording file name which can be constructed from a various fields such as CallerID, destination phone number, timestamp, call duration, call direction, account number, Anveo phone number etc. integration with external IT systems over HTTP to notify a third party system when a new Call Recording is ready so it can be processed further. 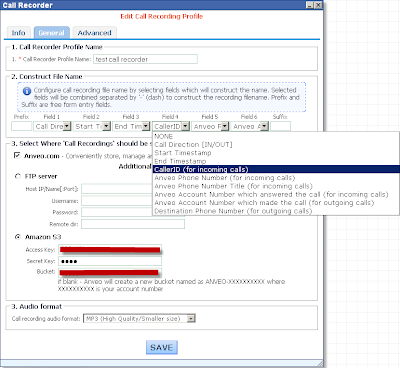 Call recorder can be enabled/disabled/configured separately for Inbound and Outbound calls. Account administrator can select which users should have their calls recorded. Each user can be configured to use separate call recorder options. Anveo Call Flow can be configured to record incoming calls using Call Recorder control which can be placed in any part of the flow to achieve true flexibility. Finally, if Anveo.com was selected as call recording storage option then call recordings can be listened, organized and downloaded right at Anveo.com user portal. Anveo.com is powerful Voice 2.0 platform designed for modern communication needs. Local or Toll Free Phone numbers from 41 countries. Web based Visual Call Flow designer. ContactMe buttons/Widgets for your website powered by Anveo Call Flow. Outbound Call Campaigns powered by Anveo Call Flow. Flexible API allows third party systems to use the power of Anveo on-demand.